We all know flowers make beautiful wedding decorations. (Come on, I know you saw Kimye’s wedding photos.) The downside: Floral arrangements can bust even the most frugal bride’s wedding budget. The upside: You can skip the flora and fauna and still have beautiful, photo-worthy decorations. Here are some ways to create centerpieces by less-traditional means. Chalkboard centerpieces offer a variety of options because they’re completely customizable. You can play around with different types of calligraphy and use chalkboard pens so your artwork stays in place. You don’t even have to be artistically inclined! There’s a wide variety of customizable templates on Etsy to give your centerpieces just the flair you’re looking for. If you like this look, why stop at centerpieces? You can use chalkboards in lots of different areas of your wedding – from directing guests to the reception area to telling them where they should sit for the ceremony. By using candles in your centerpieces, you can give your wedding a warm, inviting glow. Candles not only give off a welcoming vibe, but they’re a great way to save money while still looking polished. If the open flames freak you out, flameless votive candles are a cheap and comparable option. 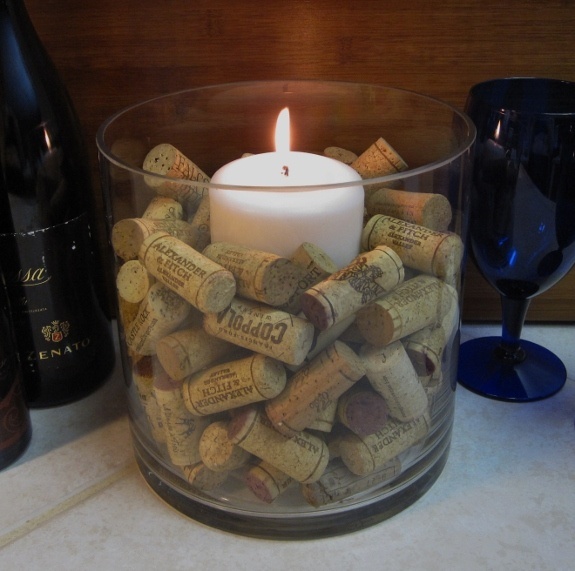 You can float them, hang them in Mason jars or even surround them with wine corks. Whatever suits your fancy – and your wedding budget. 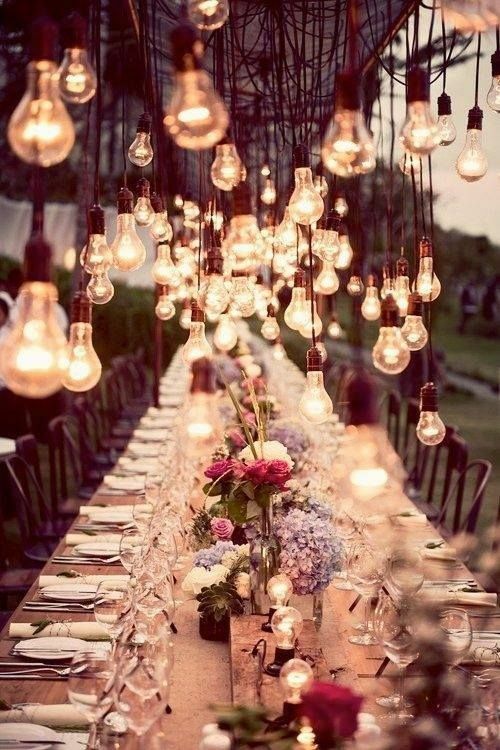 Although unconventional, light bulbs can make for versatile centerpieces. Hang Edison bulbs at different lengths to create an unexpected vertical centerpiece that will have your guests looking up all night. Or leave electricity out of it entirely and use them as your guest’s name cards. Your mind will light up with all the possibilities! Flowers aren’t the only beautiful parts of nature, but they are the priciest. Scrimp on money but not on style by using branches instead of blooms. You can even incorporate your wedding’s color scheme by spray painting the branches for a sophisticated look. Or accent them with less-expensive flowers like baby’s breath if you feel your centerpieces are missing that floral touch. Some crafty brides even choose to hang tea lights or crystal beads from the branches. You can use stones or pebbles to anchor the branches in whatever stylish container you choose for a polished, natural look. No, we’re not talking about hors d’oeuvres for the cocktail hour. Fruit can be used decoratively as well! Give your table settings a fresh look by stacking lemons in a vase with some leaves or candles. Cut vibrant citrus fruits into slices and put them in a vase for not only great color, but a new and exciting take on centerpieces. Stacking vibrantly-colored fruits such as Granny Smith apples, tangerines or lemons is a great way to incorporate your wedding’s color scheme in an unexpected way. Paper is another medium you can play with in your centerpieces. From pinwheels to paper cranes, these intricate and homemade decorations can add flair to your tables. If you’re going for a more rustic, homemade feel to your wedding – which is huge trend right now, according to Pinterest – paper centerpieces can really promote your theme. Go to your neighborhood crafting store and stock up on paper that fits your color scheme. Don’t be afraid to mix and match different prints for different tables! The great thing about using paper is that it’s completely customizable to your wedding. If you loved Kim and Kanye’s flower wall but don’t have $136,000 to spend on one, you can make a similar one out of wax paper! Although it will take a little bit more elbow grease to execute than the Kardashian-West version, this homemade backdrop will make for some sigh-inducing photos. If you don’t want to budget for floral centerpieces and decorations, that’s totally understandable. Flowers are a beautiful but pricey option. DIY-ing your way through your wedding centerpieces will not only save you money, but you’ll have totally unique, customizable decorations that you can be proud of. Save vs. Splurge: How Much Do You Need to Spend on a New Laptop?